She said he died at his home in London “surrounded by those he loved, having lived a life which was full of wonderful creativity and endeavour”. 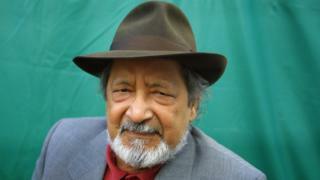 I interviewed VS Naipaul for BBC TV. When we sat down, the first thing he said was ‘tell me what you’ve read and don’t lie.’ Only then would he consent to be questioned. He moved to Britain and enrolled at Oxford University in 1950 after winning a government scholarship giving him entry into any Commonwealth university of his choosing. As a student, he struggled with depression and once attempted to take his own life. His first book, The Mystic Masseur, was published in 1957. It was made into a film directed by Ismail Merchant in 2001. In 1961 he published his most celebrated novel, A House for Mr Biswas, which took more than three years to write.